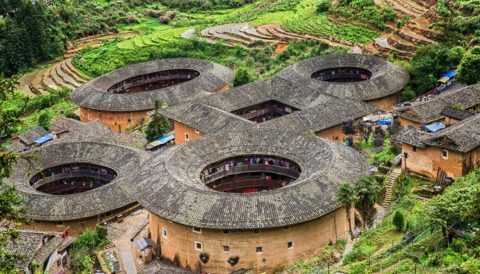 Fujian tulou (福建土楼) literally means “Fujian earthen buildings” are rural dwellings built by the Hakka people in the mountainous areas in south-west Fujian between the 15th and 20th centuries. The Hakka are believed to have migrated from northern China due to wars and famines over the past 1500 years. 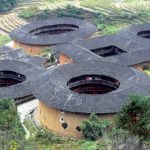 The tulou are usually large, enclosed and multi-storied homes built with wood and fortified with mud walls and most commonly circular or rectangular in configuration. 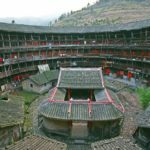 Housing an entire clan of up to 800 inhabitants, the tulou functions as a self-contained fortified village with courtyards, halls, grain stores, wells and living quarters within. 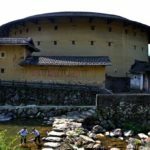 They were designed with defense, communal living and feng shui in mind and built with locally available materials like mud, river stones, and bamboo etc. – an epitome of human ingenuity and interactions with the environment. 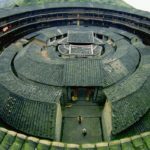 A total of 46 Fujian tulou sites were inscribed in 2008 by UNESCO as World Heritage Site. Upon arrival in Xiamen Airport, you will be picked up by our friendly guide to your hotel in Xiamen City – consistently voted as one of the most livable city in China. 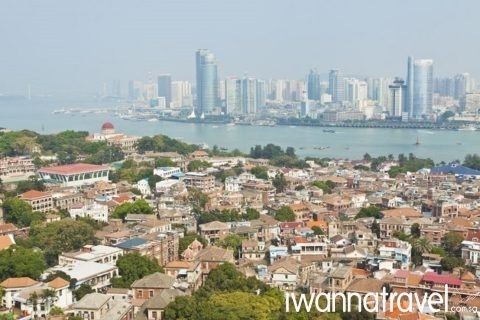 In the afternoon, enjoy a half day tour to Gulangyu Island (5-minute-ferry ride from Xiamen city) an UNESCO World Heritage Site famous for its piano museums, colonial buildings, natural landscape and car free traffic. 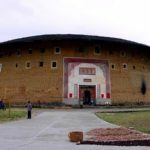 After hotel breakfast, you will take a 2.5 hours scenic drive through rural landscape to Tianluokeng Hakka Cluster (田螺坑土楼群) a square earth building surrounded by three round earth buildings and one oval shape earth building. It is figuratively named “four dishes with a soup” (四菜一汤) as its appearance resembles the layout of a typical Chinese family dinner. Hike up the nearby hill to get a Net Geo shot of the earth towers from above. 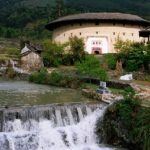 Enjoy a traditional Hakka lunch at one of the Tulou. After lunch, you can roam around to observe the inhabitants’ lifestyle. 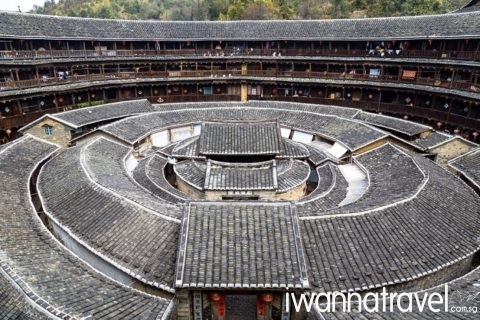 Thereafter you will visit Yuchang Lou (裕唱楼) the oldest of all tulou, famous for its tilted pillars. The most extreme ones are slanted at 15-degree angle. Walk up ancient cobblestone stairs to Zhang’s Clan Ancestral Hall, one of the most well-preserved ancient clan houses in China. 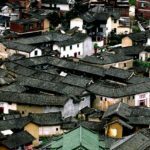 Continue your exploration at Chengqi Lou (承启楼), the biggest of them all, built in 1709, with more than 300 rooms housing 300 people of 57 families. 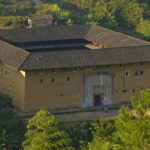 The King of Tulou is said to be built by the 15th Hakka generation; the current generation is the 30th. After dinner, check in to a tulou guesthouse in Taxia village (塔下村), an exquisite Hakka village in a lovely natural setting. 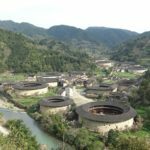 In the morning, you will visit the Nanxi Hakka Cluster (南溪土楼群)also known as “Great Wall of Tulou” with more than 100 tulou of different shapes and sizes (round, square, octagon, hexagon, triangle, ellipse, etc.) stretching for 8km along the lush Naxi river valley. Be amazed by the architecture wisdom of the builders of Huanji Lou (环极楼); the building has withstood a number of earthquakes during the past 300 years and bombings by the Kuomintang during the civil war. Another unique feature is its acoustic effect that that reverberates around the building. Thereafter you will visit Yongding Hakka Cultural Village (Hongkeng Hakka Cluster; 湖坑土楼群) which has some of the most unique styles among all Cluster: Zhenchenglou (振成樓) – a combination of Chinese and western styles; Kuijulou (奎聚楼) – a palace style building; Fuyulou (福裕楼) – a phoenix style building, Rushenglou (如升楼) – a mini-sized circular building. On your way back to your hotel in Xiamen, we will drive pass the beautiful Marathon Road also known as Islet-Ring Road which offers an unparalleled glimpse of Xiamen beautiful coastline and islets (approx. 3 hrs. drive). If time permits, you can also drop by Jimei School Village (founded by Tan Kah Kee) which is renowned for its beautiful east-west fusion architecture and natural landscape. Free and easy at your own leisure till airport transfer for your flight home. Need more information on this tour? Read through our Tulou frequently asked questions (FAQ) and get them answered! The itinerary above can be further modified or extended with the programs and activities listed below. Take a 30 min ferry ride to the military outpost of Kinmen 金門, an outlying island located just 2km off the coast of mainland China (People’s Republic of China ) but controlled by Taiwan (Republic of China). Not just for military history buffs, this once heavily guarded island has something to offer every visitor; military fortifications and tunnels, oyster farms, wetlands , bird sanctuaries and traditional villages that dated back to the Qing and Ming dynasties. (泉州) was the main eastern terminus of the Maritime Silk Road and home to a large community of foreign merchants, mariners and missionaries. Marco Polo who was believed to have visited Quanzhou described it as the busiest port in the world. The city still retains many vestiges of its former splendor. The Arab style Qingjing Mosque built in 1009 AD is one of the oldest Mosques in China. Look out for the imperial edict of Zhu Di – the third emperor of the Ming Dynasty, engraved on a stone tablet for the protection of the mosque and the faith in China. Kaiyuan Temple built in 685 AD is an interesting Hindu-Buddhist temple with some engraved columns in South Indian styles. Visit the exceptionally well preserved Luoyang Bridge, one of the four ancient bridges of China. Explore its excellent museum – Quanzhou Museum, Maritime Museum and Puppet Museum – for an educational insight into the maritime and cosmopolitan history of Quanzhou. 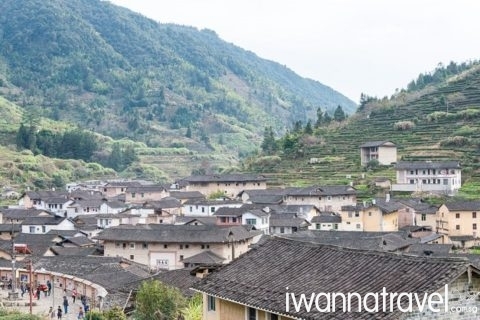 Anxi (安溪) a small and mountainous county is the home of Tie Guan Yin (literally means Iron Goddess of Mercy), a premium breed of Chinese oolong tea. Visit Tea plantations in Anxi where you can pick and hand-make your own Tie Guan Yin. Learn about tea history and culture and tea planting, harvesting and processing processes. Enroll in a day long kite surfing lesson where you can learn how to glide the sea with just a board and kite. With its long and windy sandy beaches and clear sea water, the island city of Xiamen is the preeminent kite surfing location in China.